We’ve written many times about the indiscriminate broadcasting of the inhumane pesticide 1080 over large tracts of New Zealand’s countryside. 1080 (or Sodium fluoroacetate) is a potent toxin developed for use in warehouse bait boxes. It is manufactured in the USA where its use is tightly controlled: it may only be used in chemical collars on domestic herbivores in order to kill the coyotes that prey on them. 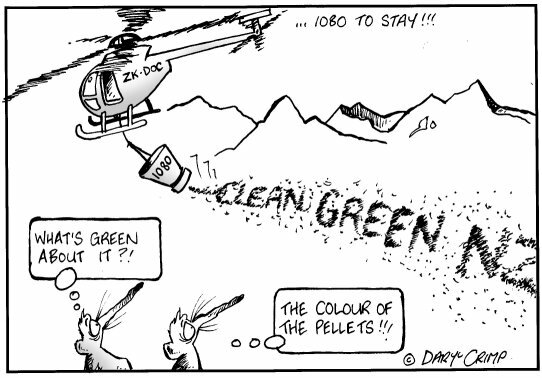 In New Zealand hundreds of tonnes of bait pellets laced with 1080 are dropped from helicopters every year. 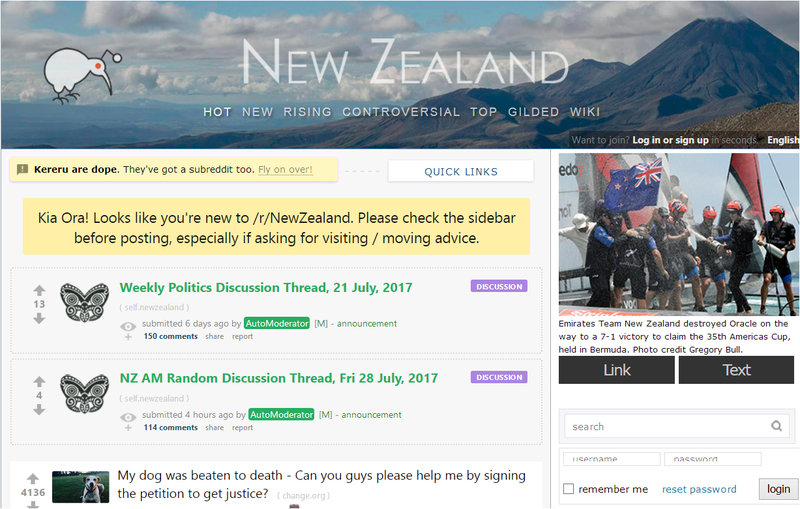 New Zealand is the world’s largest consumer of 1080, and actively lobbied to prevent a ban on the chemical’s manufacture in the US. Effectively NZ lobbyists prevented the abolition of the chemical and the development of more humane alternatives. Animals who ingest it die a long and cruel death. Its indiscriminate use kills all wildlife within the drop zone including native birds and insects that eat the pellets and also carrion feeders. It could be called justifiably the Agent Orange of the animal world. Yet despite that, and anglers being told not to eat trout in 1080 areas baited by the Department of Conservation (because the poison had been discovered in their flesh) there is a very strident pro-1080 lobby in New Zealand. The culture of shooting the messenger is endemic in NZ politics. I led a film crew from UK in 2002 looking at the aerial dispersal of 1080. We were in NZ for 6 weeks. Every time we got close to a 1080 camp deep in the back country, the vehicles took off. We found that my mobile was being used to track our movements. By dint of sending my mobile to the other side of the island, we were able to film a 1080 camp in all its horrific glory. An MP told us that a meeting between senior government ministers and lawyers was convened to see if there was a way our footage could be confiscated. Also, Jim Sutton, the then minister of Agriculture and Biodiversity, took every opportunity to rubbish what we were doing and did so in a very personal way. We took the view that his unstatesmanlike approach to a serious investigation was a sure sign we had hit a raw nerve. Since 1080 began in the Wangapeka area, trout numbers have plummeted, there is no evidence to date to say why, as no testing was or has been done, it is easier to say it is fishing pressure etc, it is pretty hard to find a dead trout as eels and currents get them away from the preying eye. and if sick they are pretty good at hiding out of site. DOC will do what DOC wants, it (1080) is proven to kill threatened species like kea, but an unproven mortality rate is apparently acceptable, but they do accept that 1080 kills kea. The problem I witnessed with 1080 and trout fishery was in the wangapeka opening weekend 2 seasons ago. I was unaware 1080 was dropped above the rolling hut area or rolling junction, less than 1km below the drop zone I chose to take a nice 4lb fish for food. If i did not walk up the rolling river for a quick look and run into pellets in the stream and bank sides it was then on walking out in disgust that I found the signs at the old rolling hut site. So much for being informed at all access points…I was later then appalled as I found out that the operators had used Courthouse flat as the load area, a designated camp site by the DEPT of CONSERVATION for those who want to stay in tents, yes sleep on the ground laced with 1080. The area had been taped off, but how long does it stay in the ground?? A new website www.1080science.co.nz highlighting the facts about 1080 poison use in New Zealand is a goingto be major obstacle for organisations like the Department of Conservation, Forest & Bird, and the Animal Health Board.For many years these powerful organisations have had a free reign on the type of information they have conveyed to the public, and officials – unchecked. Now a comprehensive assembly of information is available for those that wish to, and need to be, fully informed about 1080 poison. “We’ve discovered that computer equipment registered to Landcare Research’s internet server has been used to edit Wikipedia pages. 100% Pure New Zealand. DOC plans massive 30,000ha drop of 1080. For a while I have believed that it is only a question of time before a person is poisoned by 1080 in New Zealand, and has to die an agonising death. The level of poison used, and the total lack of adequate safety precautions makes it inevitable. The saddest part of this is that it is most likely going to be a youngster who ends up dead. 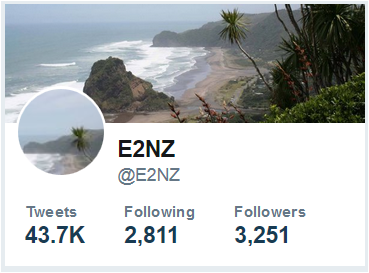 I suspect that not even the agonising death of an innocent child would stop those responsible for their wholesale use of lethal poison on the New Zealand landscape.